Chapter 1 highlighted the significance of Europe as a global player in contemporary world politics and the need to try to make sense of Europe’s global role, even if we have learned that the problems start with identifying precisely who or what ‘Europe’ is! It also provided a useful historical context for understanding European integration and introduced the important institutions of the European Union. The purpose of this chapter is to establish the approach taken in this book. We start by providing an analytical context by reviewing two of the most popular ways of analysing Europe’s role — the ‘European Unionas-actor’ and ‘institutionalist’ approaches. The limitations of both provide a justification for developing a rather different approach here derived from Foreign Policy Analysis (FPA). But before an FPA framework can be set up, two further sets of clarifications are needed which complete the subject matter of this chapter. First, we need to demonstrate that FPA can be adapted from its traditional focus on states which appears to be inappropriate in a European context. Second, we need to establish the alternative focus of the analysis here. 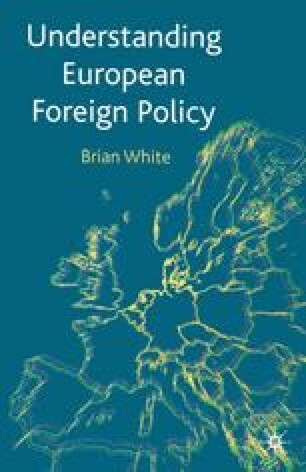 Europe’s global role will be analysed in foreign policy terms by reference to the controversial idea of ‘European foreign policy’ which needs some preliminary discussion. Some sections of this chapter draw extensively upon White, B. (1999) The European Challenge to Foreign Policy Analysis. European Journal of International Relations, 5(1): 37–66.